For this discussion, we will be using the same application we created in our last article, but will remove the reference we added during its discussion, so that we can create the proxy from scratch. So let's start the discussion. service_url : url wcf service is hosted. proxy_file_name : Proxy file name which we would like to be generated with. 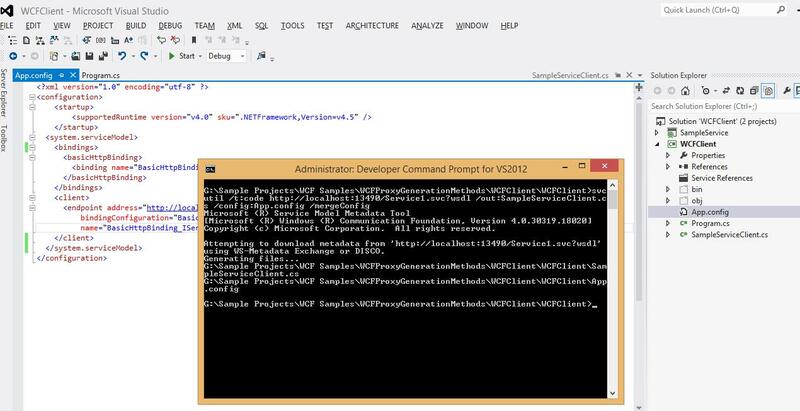 config_file_name: Name of the config file which will contain the configuration of the service to be consumed by client. Run the Visual Studio command prompt in admin mode or else you may face issue with permission in generating files. Use of mergeConfig : This specifies that we want the configuration of the wcf service to get merged into our clients' config file. For this option to work properly, make sure that you specify the config file name (in the /config: option) same as that of the clients' config file. In our case, it was App.config in client application, so we specify it to be app.config. When we run the command prompt, it will generate the proxy file in the current directory or location and not in our project location. To avoid this, we change the directory to point to our project location, and then run the command. We could also have specified the path of the directory where we would like the output files to get generated, using the /directory option. For more options, refer to MSDN.If we do not want to config files to merge, we can specify any other name in the /config: option. When this file gets generated, we can copy the configuration to out clients' config file. So here, we have changed the directory to our project location and the proxy files will be generated in the current directory i.e. project folders. 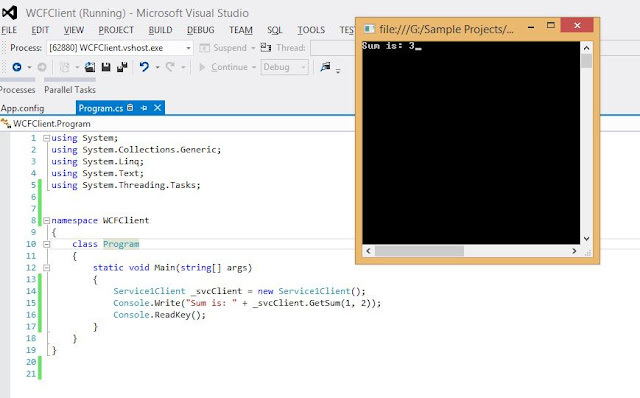 We have also specified the merge option so that the required configuration is merged in client config file. So let's run the command and see the results. Include the newly generated proxy file in the project. Now, rest of the things remain the same. The way we call the service from the client remains the same. Works like charm. Happy coding...!! !